If you are looking for natural ways to increase breast milk, you have found the best lactation supplements on the market. Boost milk supply naturally with Earthley’s breastmilk booster! Mama’s Magic Milk Boost also soothes baby’s upset tummy. As with all of our products, our breast milk enhancer is free of sugar, colors, flavors, synthetic vitamins, preservatives. Need to Increase Breastmilk Supply Naturally? Try Our Breast Milk Enhancer! Many women want to breastfeed, but some struggle to keep up with their little one’s needs, especially if they’re first-time mamas, or if they’re pumping for their little one’s feeding schedule.That’s where Earthley’s Mama’s Magic Milk Boost, a natural way to increase breast milk, comes in! 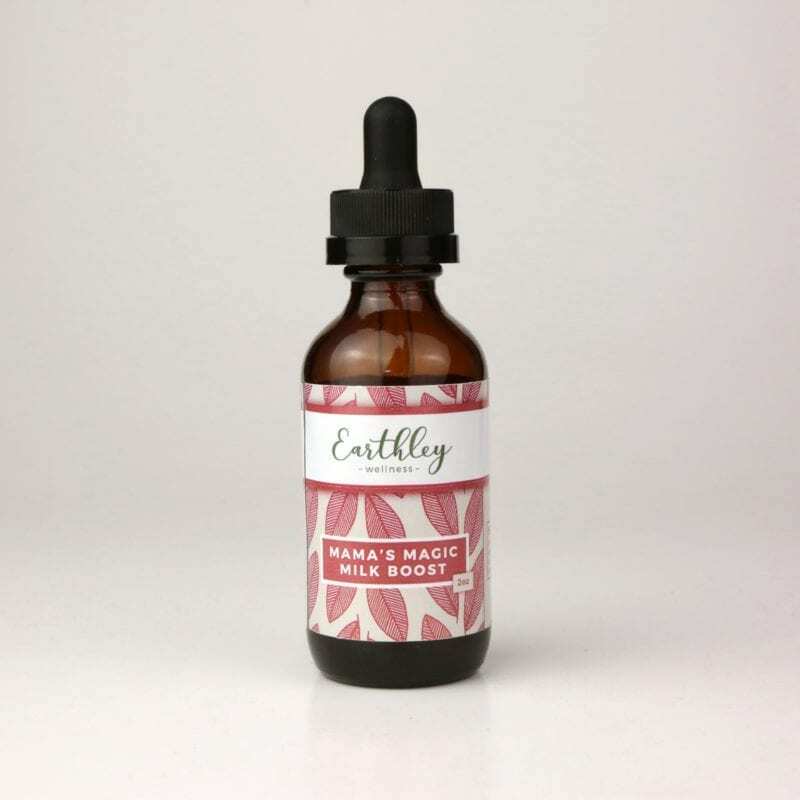 Earthley’s herbalists created an amazing breastmilk booster tincture that really works! Our formula increases milk supply with time-tested herbs that have helped millions of women nourish their bodies and boost milk supply. Raspberry leaf helps to tone smooth muscles and is filled with the vitamins and minerals breastfeeding mamas need. Fennel, blessed thistle, and marshmallow root round out the formula and can soothe baby’s upset tummies, too — this breastmilk enhancer formula does double duty! Baby benefits if you are taking this supplement to increase milk supply. Alfalfa leaf is also deeply nourishing and milk-promoting. If you are looking to increase your milk supply and nourish your body, take Mama’s Magic Boost! It works great for moms who breastfeed directly, and those who pump. All in all, this unique formula is extremely safe, balanced, and nourishing for both mama and baby! Try Our Entire Mama and Baby Line! Try all of our mama and baby items! We know you’ll love them all. Take 10-20 drops, 2-3x per day, to boost milk supply. Shelf Life: 2 years. Do not use if you have lupus or a clotting disorder without talking to a health professional. Safe while pregnant and breastfeeding. Love, love, love! It has done wonders boosting my supply back up. I was struggling being back at work and since I’ve started taking this 3x daily I’m back to making what I need to for my little one. I’ve tried MANY other things (teas, supplements, etc) with not much success and this has definitely been a game changer for me! I tried this before I weaned to help pump more for storage. I ended up getting very sick the second week into it, but my supply didn’t take a huge hit as it normally would and I actually pumped a little more than normal. I weaned shortly after I finished the bottle so only got to test for a couple weeks. Nothing else helped as much! Seems to work pretty well. I’m using to make sure I maintain a healthy supply. It has a strong taste because of the alcohol. It would be better if they could find something else to make it shelf stable. I love this stuff! I do wish it could be made with glycerin instead of alcohol but nonetheless, it gets the job done! It’s great to have something thay is natural and boosts my supply. My normal output is about 4-6 ounces when I pump at work and after a day of taking this I noticed it bumped it up to 9oz! Thanks Earthley! Great product to increase milk supply. Strong taste like with other tinctures if you take straight in the mouth, but doable!. So, I have a special place in my heart for this one. This helped save our nursing relationship and helped me get to one year plus breastfeeding. Legendairy, motherlove, moringa, milk teas, oatmeal, brewers yeast. And yes, it all helped. But it almost seemed to form a dependence. I’m excited to find lactation support without Fenugreek. I have a thyroid condition and was instructed by my midwife not to take Fenugreek because it interferes with T3 and T4 production. Almost all of the mainstream products contain fenugreek, so it’s awesome to find a natural product with out it. Looking forward to trying Earthley Milk Booster. I started taking this a month ago 3x daily and my supply has not increased whatsoever. I’m very disappointed especially since this was not cheap and the taste is horrible. Will not be buying anything else from you guys. Look for something in your email from us! I started taking it 2x a day for about a week now and my supply has definitely gone up! Not extreme to make me engorged and uncomfortable but good enough that I can ebf my son and even pump about 6oz extra per day. Must have for breastfeeding mamas! I started using this a few days ago and I can already tell a difference. Granted, it is not a drastic difference yet but since I’ve been taking it less than a week I wasn’t expecting a huge change yet. But my right side always struggles more than the left to produce and now they’re almost evened out! I can’t wait to see how much it changes after taking it for a month or longer! Thank you guys for all your amazing products. I always recommend you when someone talks about a need! I’ve been using this for a while now whenever I need a little boost in my supply. I wish I’d known about it sooner as when I first had my son I struggled with producing enough milk. If you need a bit of a boost give this a try, it helped me a lot. I previously left a review (Feb. 27) saying how excited I was to find a lactation support product without fenugreek in it…. however, after finishing a bottle I can honestly say that it did not do much, if anything, to help my milk supply. I used it 3x per day for a 28 days straight. I kept it in a ziplock bag in my pumping kit for when I was out and about so that I would not miss an afternoon dose. I really like other Earthly products, so this was a disappointment. Unlike Mimi ^^ I will continue to purchase the products I love from y’all – like the Nourish Her Naturally and the Feel Better Fast. I’m curious if the recipe has changed since last year???? the 2018 reviews are great, then Mimi and I purchased within about 2 weeks of each other and neither of us was satisfied. Hmmnn? I would be willing to try it again if Earthly was able to find out if there was a deviation to the mixture. This product is AMAZING and definitely the BEST for increasing milk supply. I tried everything for milk supply with my 1st child years ago before I found Earthly, and I still struggled especially when my period started around 9 months post partum. I barley made it to 12 months with breastfeeding and stopped because it was such a struggle to produce, even while taking so many . And now with my second child since taking this product once a day to every other day my milk supply continues strong even after starting my period again at 9mths. I dont have to make sure I’m eating all the time, I can miss eating oatmeal, and am even able to workout without negatively affecting my milk supple like they did with my first child. None of the herbal tinctures taste the best, but i do fine dropping them into my mouth and chasing with some water! My hopes and dreams were that I could breastfeed to a year or maybe 1 yr and 1/2 with my second. I really didnt know if continuing after a year was truly possible, but now I believe and know I can make it even longer with these products!! Worked wonders for my supply. Definitely helped when I needed it to! I really like this product!! It definitely helped increase supply but unfortunately my baby got really gassy from it. I will start using it again shortly since babies digestive system has matured a bit. Really hoping it doesn’t make her gassy anymore!! I started using this and immediately saw an increase in my milk supply. When I’m really consistent with it, I will produce 2-3 more ounces per session when I’m pumping! Highly recommend! !